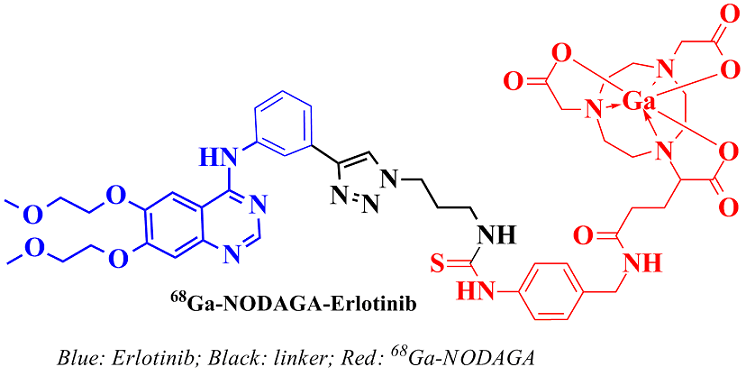 In this paper we report the synthesis of 68Ga labeled NODAGA-Erlotinib for imaging of EGFR over-expressing tumors. NODAGA-Erlotinib conjugate was synthesized by reaction of the terminal alkyne of Erlotinib using Cu catalyzed click reaction. The conjugate was then radiolabeled with 68Ga in high radiochemical yields. The 68Ga NODAGA-Erlotinib conjugate also exhibited high in vitro stability. The log P value of 68Ga-NODAGA-Erlotinib was lower than that of 68Ga-NOTA-Erlotinib, a 68Ga based Erlotinib conjugate previously reported by our group. In the in vitro cell binding studies carried out in EGFR-positive A431 cells, 68Ga-NODAGA-erlotinib exhibited an uptake (7.8±1.3 %) lower than that of 68Ga-NOTA-Erlotinib (9.8±0.4%) showing that an increase in hydrophilicity possibly effected a decrease in cell permeability. The higher hydrophilicity of 68Ga-NODAGA-Erlotinib also led to significantly lower accumulation of 68Ga-NODAGA-Erlotinib in non-target organs in the biodistribution studies in Swiss mice. The overall properties of the 68Ga-NODAGA-Erlotinib conjugate are promising and reflect the role of hydrophilicity in reducing the non-specific uptake of the final radiotracer towards improving signal/noise ratio for further imaging studies. N. Normanno, C. Bianco, A. De Luca, M.R. Maiello, D.S. Salomon. Target-based agents against ErbB receptors and their ligands: a novel approach to cancer treatment. Endocr. Relat. Cancer. 2003, 10, 1–21. P. Yang, M.S. Allen, M.C. Aubry, J.A. Wampfler, R.S. Marks, E.S. Edell, S. Thibodeau, A.A. Adjei, J. Jett, C. Deschamps. Clinical features of 5,628 primary lung cancer patients: experience at Mayo Clinic from 1997 to 2003. Chest. 2005, 128, 452–462. A. Arora, E.M. Scholar. Role of tyrosine kinase inhibitors in cancer therapy. J. Pharmacol. Exp. Ther. 2005, 315, 971–979. C. Gridelli, M.A. Bareschino, C. Schettino, A. Rossi, P. Maione, F. Ciardiello. Erlotinib in non-small cell lung cancer treatment: Current status and future development. Oncologist. 2007, 12, 840–849. S.M. Thomas, J.R. Grandis. Pharmacokinetic and pharmacodynamic properties of EGFR inhibitors under clinical investigation. Cancer Treat. Rev. 2004, 30, 255–268. J.H. Schiller. New directions for ZD1839 in the treatment of solid tumors. Semin. Oncol. 2003, 30, 49–55. M.H. Cohen, J.R. Johnson, Y.F. Chen, R. Sridhara, R. Pazdur. FDA drug approval summary: erlotinib (Tarceva) tablets. Oncologist. 2005, 10, 461–466. C. Boch, J. Kollmeier, A. Roth, S. Stephan-Falkenau, D. Misch, W. Grüning, T.T. Bauer, T. Mairinger. The frequency of EGFR and KRAS mutations in non-small cell lung cancer (NSCLC): routine screening data for central Europe from a cohort study. BMJ Open. 2013, 3, e002560. doi: 10.1136/bmjopen-2013-002560. A. Marchetti, C. Martella, L. Felicioni, F. Barassi, S. Salvatore, A. Chella, P.P. Camplese, T. Iarussi, F. Mucilli, A. Mezzetti, F. Cuccurullo, R. Sacco, F. Buttitta. EGFR mutations in non–small-cell lung cancer: analysis of a large series of cases and development of a rapid and sensitive method for diagnostic screening with potential implications on pharmacologic treatment. J. Clin. Oncol. 2005, 23, 857–865. W. Pao, V.A. Miller, K.A. Politi, G.J. Riely, R. Somwar, M.F. Zakowski, M.G. Kris, H. Varmus. Acquired resistance of lung adenocarcinomas to gefitinib or erlotinib is associated with a second mutation in the EGFR kinase domain. PLoS Med. 2005, 2, e73. doi: 10.1371/journal.pmed.0020073. P. Slobbe, A.J. Poot, A.D. Windhorst, G.A. Dongen. PET imaging with small-molecule tyrosine kinase inhibitors: TKI-PET. Drug Discov. Today. 2012, 17, 1175–1187. J.W. Hicks, H.F. Van Brocklin, A.A. Wilson, S. Houle, N. Vasdev. Radiolabeled small molecule protein kinase inhibitors for imaging with PET or SPECT. Molecules. 2010, 15, 8260–8278. E. Mishani, G. Abourbeh, M. Eiblmaier, C.J. Anderson. Imaging of EGFR and EGFR tyrosine kinase over expression in tumors by nuclear medicine modalities. Curr. Pharm. Des. 2008, 14, 2983–2998. G.A. van Dongen, A.J. Poot, D.J. Vugts. PET imaging with radiolabeled antibodies and tyrosine kinase inhibitors: immuno-PET and TKI-PET. Tumour Biol. 2012, 33, 607–615. T.A. Bonasera, G. Ortua, Y. Rozen, R. Krais, N.M.T. Freedman, R. Chisin, A. Gazit, A. Levitzki, E. Mishani. Potential 18F-labeled biomarkers for epidermal growth factor receptor tyrosine kinase. Nucl. Med. Biol. 2001, 28, 359 –374. G. Abourbeh, S. Dissoki, O. Jacobson, A. Litchi, R. Ben Daniel, D. Laki, A. Levitzki, E. Mishani. Evaluation of radiolabeled ML04, a putative irreversible inhibitor of epidermal growth factor receptor, as a bioprobe for PET imaging of EGFR-overexpressing tumors. Nucl. Med. Biol. 2007, 34, 55–70. C. Neto, C. Fernandes, M.C. Oliveira, L. Gano, F. Mendes, T. Kniess, I. Santos. Radiohalogenated 4-anilinoquinazoline-based EGFR-TK inhibitors as potential cancer imaging agents. Nucl. Med. Biol. 2012, 39, 247– 260. D.P. Holt, H.T. Ravert, R.F. Dannals, M.G. Pomper. Synthesis of [11C]gefitinib for imaging epidermal growth factor receptor tyrosine kinase with positron emission tomography. J. Label. Compd. Radiopharm. 2006, 49, 883–888. A. Bourkoula, M. Paravatou-Petsotas, A. Papadopoulos, I. Santos, H.J. Pietzsch, E. Livaniou, M. Pelecanou, M. Papadopoulos, I. Pirmettis. Synthesis and characterization of rhenium and technetium-99m tricarbonyl complexes bearing the 4-[3-bromophenyl]quinazoline moiety as a biomarker for EGFR-TK imaging. Eur. J. Med. Chem. 2009, 44, 4021–4027. C. Fernandes, I.C. Santos, I. Santos, H.J. Pietzsch, J.U. Kunstler, W. Kraus, A. Rey, N. Margaritis, A. Bourkoula, A. Chiotellis, M. Paravatou-Petsotas, I. Pirmettis. Rhenium and technetium complexes bearing quinazoline derivatives: progress towards a 99mTc biomarker for EGFR-TK imaging. Dalton Trans. 2008, 3215–3225. F. Pisaneschi, Q.D. Nguyen, E. Shamsaei, M. Glaser, E. Robins, M. Kaliszczak, G. Smith, A.C. Spivey, E.O. Aboagye. Development of a new epidermal growth factor receptor positron emission tomography imaging agent based on the 3-cyanoquinoline core: Synthesis and biological evaluation. Bioorg. Med. Chem. 2010, 18, 6634–6645. M. Wang, M. Gao, Q.H. Zheng. The first radiosynthesis of [11C]AZD8931 as a new potential PET agent for imaging of EGFR, HER2 and HER3 signaling. Bioorg. Med. Chem. Lett. 2014, 24, 4455–4459. P. Johnstrom, A. Fredriksson, J.O. Thorell, S. Stone-Elander. Synthesis of [methoxy- 11C]PD153035, a selective EGF receptor tyrosine kinase inhibitor. J. Label. Compd. Radiopharm. 1998, 41, 623–629. J.R. Petrulli, J.M. Sullivan, M.Q. Zheng, D.C. Bennett, J. Charest, Y. Huang, E.D. Morris, J.N. Contessa. Quantitative analysis of [11C]-Erlotinib PET demonstrates specific binding for activating mutations of the EGFR kinase domain. Neoplasia. 2013, 15, 1347–1353. A.A. Memon, S. Jakobsen, F. Dagnaes-Hansen, B.S. Sorensen, S. Keiding, E. Nexo. Positron Emission Tomography (PET) imaging with 11C-labeled Erlotinib: A micropet study on mice with lung tumor xenografts. Cancer Res. 2009, 69, 873–878. I. Bahce, E.F. Smit, M. Lubberink, A.A. van der Veldt, M. Yaqub, A.D. Windhorst, R.C. Schuit, E. Thunnissen, D.A. Heideman, P.E. Postmus, A.A. Lammertsma, N.H. Hendrikse.. Development of [11C]erlotinib positron emission tomography for in vivo evaluation of EGF receptor mutational status. Clin. Cancer Res. 2013, 19, 183–193. S. Huang, Y. Han, M. Chen, K. Hu, Y. Qi, P. Sun, M. Wang, H. Wu, G. Li, Q. Wang, Z. Du, K. Zhang, S. Zhao, X. Zheng. Radiosynthesis and biological evaluation of 18F-labeled 4-anilinoquinazoline derivative (18F-FEA-Erlotinib) as a potential EGFR PET agent. Bioorg. Med. Chem. Lett. doi: http://dx.doi.org/10.1016/j.bmcl.2017.08.066. F. Röesch, P.J. Riss. The renaissance of the 68Ge/68Ga radionuclide generator initiates new developments in 68Ga radiopharmaceutical chemistry. Curr. Top. Med. Chem. 2010, 10, 1633–1668. M.I. Prata, A.C. Santos, C.F. Geraldes, J.J. de Lima. Structural and in vivo studies of metal chelates of Ga(III) relevant to biomedical imaging. J. Inorg. Biochem. 2000, 79, 359–363. I. Velikyan. 68Ga-based radiopharmaceuticals: Production and application relationship. Molecules. 2015, 20, 12913–12943. A. Jain, M. Kameswaran, U. Pandey, K. Prabhash, H.D. Sarma, A. Dash. 68Ga labeled Erlotinib: A novel PET probe for imaging EGFR over-expressing tumors. Bioorg. Med. Chem. Lett. doi: http://dx.doi.org/10.1016/j.bmcl.2017.08.065. F.L. Zhang, Q. Huang, K. Zheng, J. Li, J.Y. Liu, J.P. Xue. A novel strategy for targeting photodynamic therapy. Molecular combo of photodynamic agent zinc(II) phthalocyanine and small molecule target-based anticancer drug erlotinib. Chem. Commun. 2013, 49, 9570–9572. X. Meng, B.W.Jr. Loo, L. Ma, J.D. Murphy, X. Sun, J. Yu. Molecular imaging with 11C-PD153035 PET/CT predicts survival in non-small cell lung cancer treated with EGFR-TKI: a pilot study. J. Nucl. Med. 2011, 52, 1573–1579. N. Liu, M. Li, X. Li, X. Meng, G. Yang, S. Zhao, Y. Yang, L. Ma, Z. Fu, J. Yu. PET-based biodistribution and radiation dosimetry of epidermal growth factor receptor-selective tracer 11C-PD153035 in humans. J. Nucl. Med. 2009, 50, 303–308. B. Weber, M. Winterdahl, A. Memon, B.S. Sorensen, S. Keiding, L. Sorensen, E. Nexo, P. Meldgaard. Erlotinib accumulation in brain metastases from non-small cell lung cancer: visualization by positron emission tomography in a patient harboring a mutation in the epidermal growth factor receptor. J. Thorac. Oncol. 2011, 6, 1287–1289. A.A. Memon, B. Weber, M. Winterdahl, S. Jakobsen, P. Meldgaard, H.H. Madsen, S. Keiding, E. Nexo, B.S. Sorensen.. PET imaging of patients with non-small cell lung cancer employing an EGF receptor targeting drug as a tracer. Br. J. Cancer. 2011,105, 1850–1855.